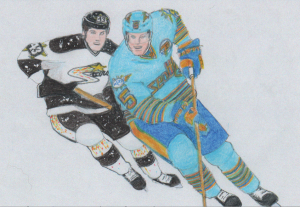 OK, here's part two of my entries for the Seattle NHL uniform challenge being put on by the Uni Watch column at ESPN.com. 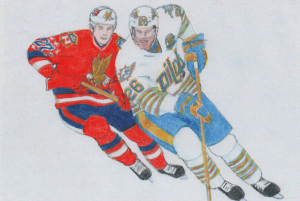 As described in my prior entry, this is my adaptation of the wonderful uniforms of baseball's short-lived Seattle Pilots to a hockey configuration. For my friends who are fans of the Legion of Super-Heroes and have some interest in my uniform re-designs, this entry is for you. 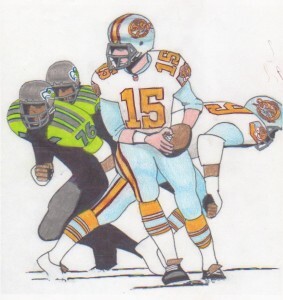 ESPN.com's Uni Watch column is running another design contest, this time to suggest a look for the expected Seattle NHL expanson franchise. Luckily for me, the deadline came after the Thanksgiving weekend and I was caught up enough on things in general that I was able to devote the necessary time to pull an entry together -- in fact I couldn't narrow it down to just one concept and managed to do two entries. 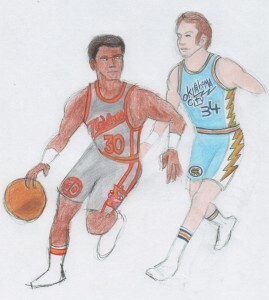 Part of the issue was that it popped into my mind to suggest hockey adopt one of the best designs in sports history, and one that's criminally left ignored and unused these days, the uniforms for the beloved 1969 Seattle Pilots (who were moved after a single season to Milwaukee, where they've played ever since as the Brewers). And once I got that idea for a Pilots hockey team in my head, I had to go with it, even though it felt like it wouldn't get full consideration as a "real" entry but rather a kind of novelty entry (even though I personally would 100% love to see the name and design actually take to the ice in the NHL). And in any case, a Pilots concept would be based on somebody else's long-ago design rather than something completely original on my part. So I felt compelled to do a second totally original submission. 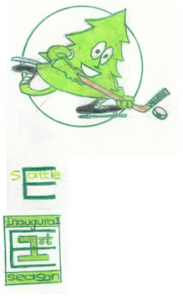 And when I thought I abouy doing something that showcased the neon green color Seattle sports fans have so embraced, I tried to think of a name that suggested a green uniform, and with Washington being the Evergreen State, the name "Evergreens" seemed like a natural, especially when I then saw in my mind an unabashedly joyous pine tree cartoon character playing hockey. If I needed one more nudge to go with an Evergreens concept, I got it when I also saw in my mind a big capital "E" like what Legion of Super-Heroes member Element Lad used to wear in his early days (in the case of the Evergreens, I'd add a lower-case "s_attle" to that big capital "E" to spell out Seattle). With these different ideas feeling rightand falling into place for me, I felt like this, too, was a design I must get down on paper. So that's Legion reference #1, with a second one coming later on. 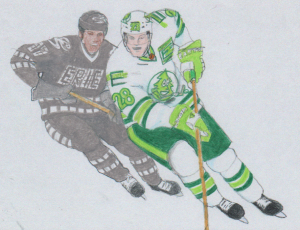 For the opposing teams, versus the white-jerseyed Evergreens, I finally put down on paper the idea I had back in the 1990s when I failed to enter the local contest to name the Erie minor-league hockey team -- at that time I should have suggested a team identity I made up with some of my brothers (Bob and / or Jim?) for a fictitious hockey league we were playing, the Erie Specters. 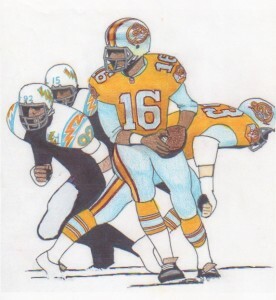 Here for the first time in 45 years or so I'm updating whatever visuals we may have created for the Specters back then and a giving them team colors of gray and white and a wordmark and numbers in the kind of dashed lines comics used to use to illustrate phantoms and invisible characters. 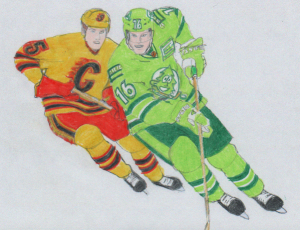 Versus the dark-jerseyed Evergreens is a re-design of the Calgary Flames. And I think I'll do a separate post for the Pilots artwork. 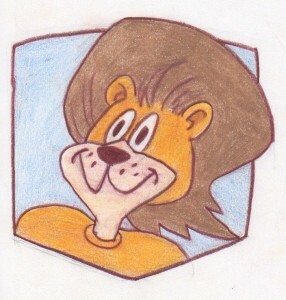 Cartoon mascot? Check. In fact, two of them. Brighter colors? 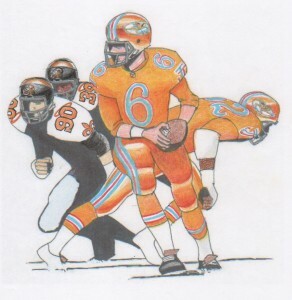 Check (though one could scarcely get any less bright than the Raiders' traditional colors of silver and black). For some reason, this photo takes me right back to visiting relatives in Queens, NYC right before Christmas in 1963, though the game is in Buffalo three days after Christmas. 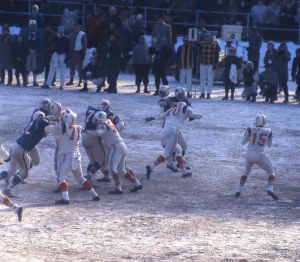 Again, that almost impossible combination of a snow-covered football field when the sun is out makes it look the way I remember the snowy days up in New York City or at home on Christmas when I was a kid. Oh, and for once I'll perform the important courtesy of attributing the photo, which I copied out of a greet book on the AFL history of the Bills, called "Rockin' the Rockpile," with this photo being credited to Robert L. Smth of Orchard Park, N.Y. I found the prior photo on a "Best AFL Photos" page on Pinterest, though I'm unable to track it down again. What makes this picture so special is the very rare occurance of a snow-covered football field on a sunny day. Since they keep the fields covered until game time, any snow on the field has to fall after the game starts. So snowy games are a rare occurence to begin with and it's infinitely more rare to get enough snow to blanket the grass and then also get sunny conditions within the same game. 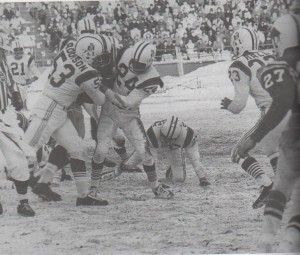 This happened for least a brief period during the 1963 AFL East playoff, won by the Patriots 26-8 on Dec. 28, 1963. We were living in Delaware at this time and got a rare white Christmas that year. Pictures from this Christmas week game sure take me back to what snowy days looked back then. 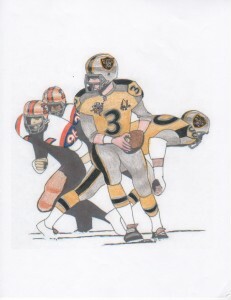 I really didn't start rooting a lot for these two teams until they went into decline in 1967 and beyond, but I now have great nostalgia for their battles that decided the AFL East title in '63, '64 and '66, in part because I remember decorating the Christmas tree one year when they were playing a vital game late in the AFL season. Here's an entry that's much-delayed from last summer, when ESPN.com held its most recent uniform re-design contest, this time a challenge to overhaul the Minnesota Timberwolves (who I re-named the Minneapolis Timberwolves since I much prefer teams named after cities rather than states of regions). 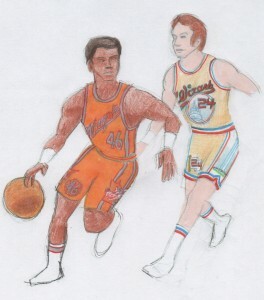 At the risk of tooting my own horn, it occurred to me during the last espn.com sports-uniform re-design contest that I'd had a decent streak of being named either a "winner" or at least getting an "honorable mention" (HM) in several of the contests. It seemed to me like it had been as many as four or five in a row. So when I got another HM in this week's Detroit Lions re-design contest, I tried to figure out how long my winning/"honorable" streak might be. 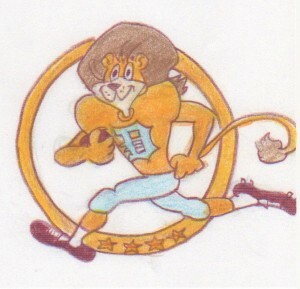 And based on what I've posted on this journal, it looks like (going backwards in time), I was either a winner or HM for contests to re-design the Lions, the L.A. Rams, the Toronto Maple Leafs, the LA. 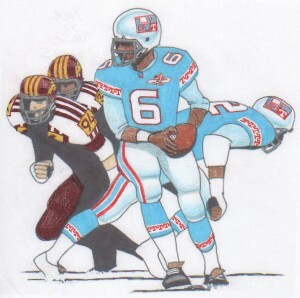 Clippers, an aniticpated Las Vegas NHL team, the Portland Trail Blazers, the Charlotte Hornets, the Minnesota Vikings and the Miami Dolphins. To my surprise, if my method of counting is accurate, my streak is up to nine contests in a row. 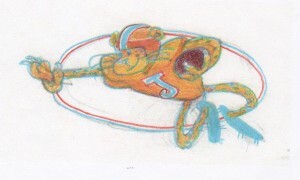 Further, as near as I can tell, I've entered a total of 12 contests and been a winner or HM 11 times (striking out only with a Cleveland Browns design [that I thought was actually one of my better entries considering the limitation that you had to keep the team's current helmet -- and therefore couldn't change the color scheme]).